Update: We’ve published an in-depth article about The Gaze-Controlled Wheelchair that Won the Hackaday Prize. Eyedriveomatic are the Grand Prize winners of the 2015 Hackaday Prize. The winners were just announced on stage at the Hackaday Superconference, and awarded by the prize Judges. Eyedriveomatic is a non-invasive method of adding eye-control to powered wheelchairs. Many times these wheelchairs are rented and permanent alterations cannot be made. This inexpensive and easily adaptable hardware has the power to improve life for those who need more options for controlling powered wheelchairs. We will be publishing more information about this year’s winners in the coming week. The full standings are listed below. Please check out all of the 2015 Hackaday Prize Finalist and the Best Product Finalists. When it comes to the history of medicine and drugs, Aspirin, or more properly acetyl-salicylic acid, is one of the more interesting stories. Plants rich in salicalates were used as medicines more than four thousand years ago, and in the fourth century BC, [Hippocrates] noted a powder made from willow bark was an excellent analgesic. It was only in the 1800s that acetylated salicylic acid was first synthesized. In 1897, chemists at Bayer gave this ancient remedy a new name: Aspirin. It’s on the WHO List of Essential Medicines, but somehow millions of people don’t have access to this pill found in every pharmacy. [M. Bindhammer] is working to make Aspirin for Everyone for his entry to the Hackaday Prize, using a small portable lab designed around chemicals that can be easily obtained. The most common synthesis of Aspirin is salicylic acid treated with acetic anhydrate. Acetic anhydrate is used for the synthesis of heroin, and of course the availability of this heavily restricted by the DEA. Instead, [M. Bindhammer] will use a different method using salicylic acid and acetic acid. If you’re keeping track, that’s replacing a chemical on a DEA list of precursors with very strong vinegar. [M. Bindhammer] even has a design for the lab that will produce the Aspirin, and it’s small enough to fit in a very large pocket. Everything that is needed for the production of acetyl-salicylic acid is there, including a reaction vessel with a heating element, a water/oil bath, flask, an Allihn condenser, and a vacuum filtering flask. Even if shipping millions of pills to far-flung reaches of the planet were easy, it’s still an exceptional Hackaday Prize entry. With few exceptions, most of The Hackaday Prize are things we really haven’t seen much of before: base-3 computers that have been relegated to the history books, extremely odd 3D printers, and fancy, new IoT devices are the norm. The OSRC is not a new project to us. (UPDATE: Looks like they deleted their project page. Here is a snapshot of it from the Internet Archive) We saw it once in 2011 and again a year later. What makes the OSRC an interesting project for The Hackaday Prize isn’t the fact that it’s the most advanced RC transmitter ever created. Creating that was evidently the easy part. The OSRC could use a big financial kick in the pants, and if [Demetris] wins, we’d guess he wouldn’t be taking that ride to space. Rather, he’d be taking the cash prize to get his ultimate transmitter into large-scale manufacturing and out into the wild. While at first glance the base model OSRC seems expensive at about $6-700 USD, consider this: a six-channel transmitter from an excellent brand costs about $120 USD. Nine channels will run you about $400. The OSRC is a forty channel radio. 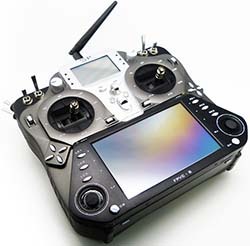 The sticks are capable of force feedback, and of course the ‘pro’ model of the OSRC has that wonderful screen, capable of displaying video from an FPV camera, a GPS/map overlay, or an incredibly extensive telemetry display. There are multi-thousand dollar avionics for real airplanes out there that have a smaller feature set, and that’s not hyperbole. A few months ago, [Demetris] was interviewed by the awesome people at Flite Test. That (highly suggested) video is embedded below.